Images L to R: Mondongo (Argentina) 32 Red riding hoods with empty basket without wolf, 2004. Plasticine on wood panel. 78 3/4 x 118 1/2 in. Courtesy of Track 16 Gallery. Mondongo (Argentina) Dancing with myself, 2006-2007. Plasticine on wood. 78 3/4 x 118 1/8 in. Courtesy of Track 16 Gallery. MOLAA is pleased to inaugurate The Portfolio Series with Mondongo. Mondongo is a collective of young Argentine artists established in 1999 by Agustina Picasso, Juliana Laffitte and Manuel Mendanha. They began exhibiting internationally in 2004 and their work appears in many important collections such as Tate Modern in London and MOMA in New York. The collective’s title comes from mondongo, which means tripe—an ingredient found in dishes popular throughout Latin America. It reflects the artists’ desire to appeal to a general audience and also references the figurative and literal consumption of their paintings, which use food such as cookies and cured meats. Mondongo’s eclectic use of materials and references to mass media images, cultural icons and popular myths, places their work at the intersection of Pop Art, Surrealism, Kitsch and Conceptual Art. 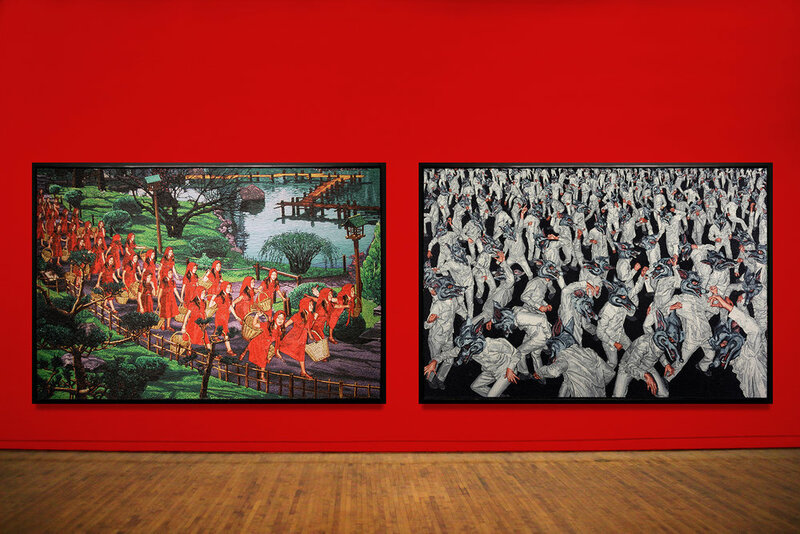 These two monumental paintings are taken from the Red Series, a collection of fourteen works originally exhibited under the title, What a Big Mouth You Have, in Buenos Aires. They reinterpret the story of Little Red Riding Hood, a classic folk tale which was eventually transformed into the internationally familiar fairy tale by author Charles Perrault. Mondongo interprets snapshots of the story using plasticine, a material we associate with childhood but which is also used to create stop-motion animation, adding to the idea of an always changing and flexible narrative.